I have been a professional musician for the past 40 years, but have always loved and needed to be creative with my hands in some material as well… a good balance to the etherial nature of music. A few years ago, a dear friend, master artist Rene’ Deerheart, turned me on to the beauty and joy of working with copper and silver. 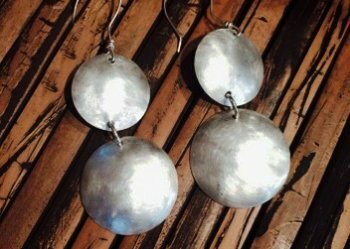 I began with metal chain knitting and later forming copper and sterling sheets. I am honored and inspired to be included in the community of amazing artists at Orcas Island Artworks.